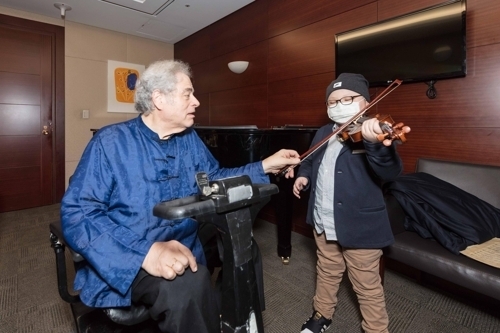 A child violinist battling leukemia had the chance of a lifetime when his musical hero Itzhak Perlman gave him a special one-on-one master class. Cha Hee-su, 8, was greeted at the waiting room where Perlman was resting after his concert at Seoul Arts Center on Sunday. Cha played “Humoresque,” a piece he had been practicing 20 minutes a day the last three days, which require great effort given his weak physical conditions. Perlman carefully listened to him playing and offered advice on his posture and playing style. Cha Hee-su, a Korean child violinist battling leukemia, plays the violin in front of Itzhak Perlman at his waiting room in Seoul Arts Center, late Sunday. The meeting was arranged by Make-a-Wish Foundation, a charity working to give special experiences to children with life-threatening illnesses. Cha, who previously had excelled at violin competitions, experienced difficulty in playing after going into chemotherapy. He reportedly continued to listen to Perlman’s performances while in the hospital for treatments. Perlman’s history of overcoming polio as a child added special significance to his meeting with Cha. Perlman, whose legs are permanently paralyzed by polio, performs violin while seated.